Vietnamese Zen Master Thich Nhat Hanh might be best known for his spiritual leadership, poetry and activism, but it's his calligraphic meditation practice that has most impacted the lives of people in search of inner peace through mindfulness. The calligraphy maestro's long-running exhibition "Calligraphic Meditation: The Mindful Art Of Thich Nhat Hanh" is currently on display at the Bangkok Art and Culture Centre (BACC). Thich Nhat Hanh, who founded the Engaged Buddhism movement in 1966, first introduced Thais to calligraphic meditation in 2013. In the ensuing six years, he has added to his collection; the BACC exhibition features 73 calligraphic works and over 600 books. Born in central Vietnam in 1926, Thich Nhat Hanh began working in calligraphy in 1994, mainly using it for his books, songs and articles. It did not take long before he came up with the style of "calligraphy phrases" where he mixed insights, teachings and art together on the paper. Commonly referred to as "Thay", which in Vietnamese means "master" or "teacher", Thich Nhat Hanh is often quoted as saying: "If we just act with awareness and integrity, our art will flower, and we don't have to talk about it at all. When we know how to be in peace, we find that art is a wonderful way to share our peacefulness." 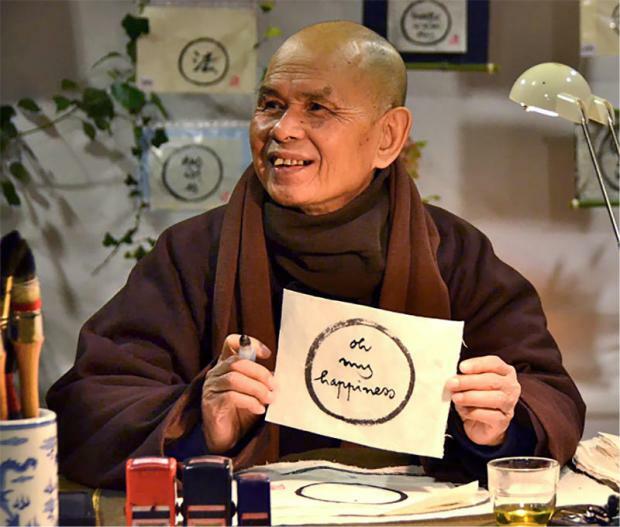 Thay's calligraphy expresses his teachings in traditional Chinese ink on rice paper. The exhibition reflects a lifetime of meditative insight, peace and compassion through each stroke of the brush. Thay's works are a balanced fusion of East and West, with many of them written in Roman script. His work nevertheless always manages to retain an eastern Zen feel to it. The Venerable Thich Phap Kham of Plum Village said at the recent opening of the exhibition that Thay's calligraphy stands for accessible, down-to-earth, practical Zen: "Unadulterated yet powerful, stark but full of spirit, together with a moral lesson that is not just deeply profound but relevant to daily life. 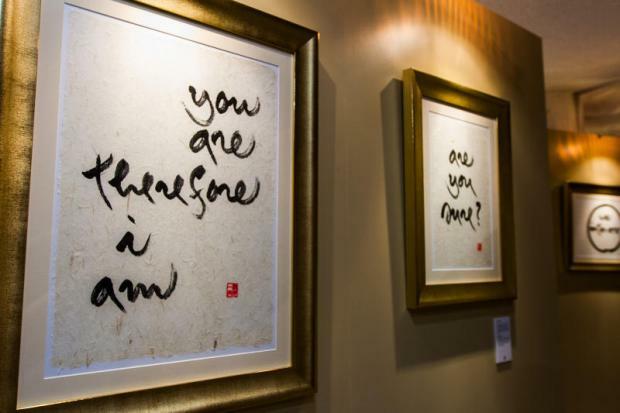 Thay's works of calligraphy are art, but also teachings and tools for mindfulness practice. I would best describe Thich Nhat Hanh as being a person who is mindful from when he drinks his tea to the simple act of sitting down. Any person who has his work in their home and practises with it is his student." Thay set up the famous Plum Village near Bordeaux in southwest France in 1982 as a small, rustic farmstead. Today, it has grown into Europe's largest Buddhist monastery, with over 200 resident monks and nuns. In addition to calligraphy meditation, Plum Village has become known around the world for mindfulness practice and how it incorporates it into everyday activities. Cambridge-educated Bhikkhuni Chan Hien Nghiem, who has made Plum Village her permanent home for the past 11 years, said her experience at the monastery has made her the person she is today. "At Plum Village, we put mindfulness into all our daily activities, training ourselves to be mindful the entire day, be it while we eat, walk or work," she said. She teaches dhamma classes to visitors who go for retreats at the monastery. 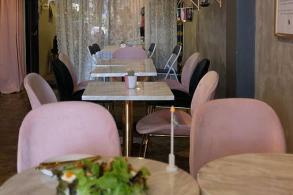 Now in her 30s, Nghiem formerly worked as a political journalist with the BBC, and led an on-the-go lifestyle. It was her quest for wisdom that eventually brought her to Plum Village. "I always thought that going to university would help me to have a deep understanding of life or something," she recalled. "I was looking for meaning and, above all, wisdom. I thought university was the answer to my search for wisdom. 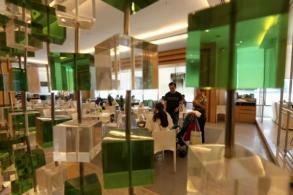 What I encountered there was a lot of knowledge and information, but not so much wisdom." Her experience at Cambridge gave her the confidence and courage to search more widely for what she was seeking. Friends who had visited Plum Village shared their experiences with her, highlighting in particular the Full Awareness Of Breathing exercise. At 21, she decided to travel alone to the southwest of France to experience Thay's teachings for herself. Following that trip up with a three-week retreat brought her closer to attaining her goal. "I have always been inspired by Thay's teachings," she said. "He is a man of wisdom. His Full Awareness Of Breathing exercise helped me address exam jitters, as well as the stresses that come from being a journalist." What really worked for her was the manner in which each of the five Buddhist precepts was addressed. For example, there is much more to the concept of not stealing. The precept extends to how to be generous with one's time, energy and money. "Calligraphic Meditation: The Mindful Art Of Thich Nhat Hanh" runs until Sunday at the Bangkok Art and Culture Centre (BACC).